Sat., Jan. 14, 2017, 7:11 a.m.
SEATTLE – The federal government is considering whether it should set up an area off Washington’s San Juan Island where endangered killer whales would be protected from motorboats and other disturbances. Most motorized vessels would be banned under a proposed whale protection zone sought by three conservation groups. Puget Sound orcas face multiple threats, including pollution, lack of prey and impacts from boats. The zone is a common-sense approach that can be implemented immediately, Orca Relief Citizens’ Alliance, Center for Biological Diversity and Project Seawolf said in a petition filed with NOAA Fisheries. The agency announced Thursday it is seeking input from industry, tribes, government agencies and others on the November petition before deciding whether to proceed. NOAA Fisheries said studies indicate that the whales forage less in the presence of boat traffic. 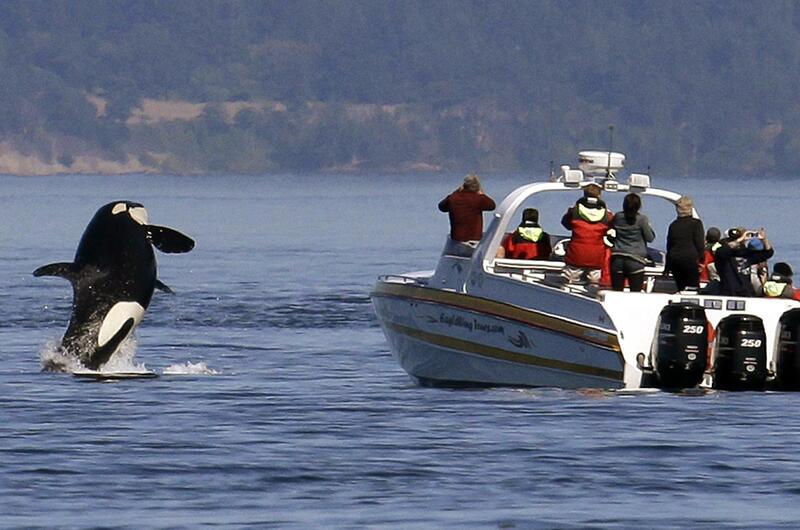 The orcas rely heavily on underwater sounds to find food and communicate, and boat noise may disrupt that process. Killer whales can be found in many oceans, but this small distinct population can typically be found in Puget Sound from spring to fall. They use unique calls to communicate with one another and eat salmon rather than marine mammals. The orcas were listed as endangered in 2005. NOAA Fisheries says they’re among the species most at risk for extinction in the near future. With the loss of seven animals in 2016, the population is down to 78. “We’re looking at every option and every opportunity to address the threats to these whales,” Barry Thom, administrator of NOAA Fisheries West Coast Region, said in a statement Thursday. NOAA Fisheries considered a similar no-go zone in 2011 but declined to move forward, citing strong opposition at the time. Jeff Friedman, U.S. president of the Pacific Whale Watch Association, told KING-TV in Seattle that the primary challenge the whales face is lack of salmon. “This petition is a really big distraction for the real issues facing the southern resident killer whales,” he told the Seattle station. They’re proposing a zone larger and wider than the one considered in 2011. They’re also asking for an additional 1/4-mile buffer to give the whales “more quiet and rest” in their key habitat area and for the rules apply between April 1 to Sept. 30. Published: Jan. 14, 2017, 7:11 a.m.